Glaucoma is often called the “silent thief of sight”. In its early stages symptoms are hard to recognize. People affected by glaucoma often do not know they have it. Loss of vision normally occurs gradually. Untreated, glaucoma permanently damages the optic nerve, leading to blindness. If it is detected early enough the progress of the disease can be arrested with medical and surgical means. The doctors at Midshore Surgical Eye Center offer annual eye examinations for those over the age of 40 to monitor eye diseases such as glaucoma so proper treatment can be delivered and vision loss can be avoided. Our understanding of glaucoma has changed over time. The current view is that glaucoma is the end stage shared by a group of eye diseases. To understand this, think of heart failure - it's not a disease, rather it is the clinical end stage of many diseases like coronary artery disease and has multiple risk factors. 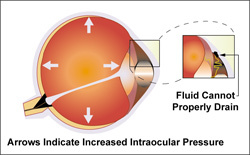 If your eye doctor has told you that you have high intraocular pressure, or if your eye doctor has told you that you might have the beginning stages of glaucoma, you will want to read the information below. Many people often think that glaucoma is an eye disease that affects only seniors. Glaucoma can strike adults even in their early thirties. Many of you may remember a famous Minnesota Twins baseball player named Kirby Puckett. In 1995 Kirby Puckett was the MVP of the World Series and the next year he was blind in one eye. At the age of 35 his baseball career was over. This was absolutely catastrophic for the Minnesota Twins, their fans, Kirby Puckett and his friends and family. Let the story of this baseball legend be a lesson regarding regular eye exams. Regular eye exams can save your vision, because glaucoma can be treated if detected. Glaucoma is an eye disease that slowly and painlessly steals away your sight. Glaucoma is called the silent or sneak thief of sight because it has no symptoms. It does not make your eyes red or cause pain. However, it is the second leading cause of blindness in the United States, and half of the people who have glaucoma don’t know that they have the disease and are not aware that they are going blind. To learn more about glaucoma, click the video animations below.